"A Thousand Things" by Paul Weller – Paul Weller News! Just in case you don’t know about this upcoming book, here’s a bit of info. It’s quite expensive, but has a few choice limited edition features. 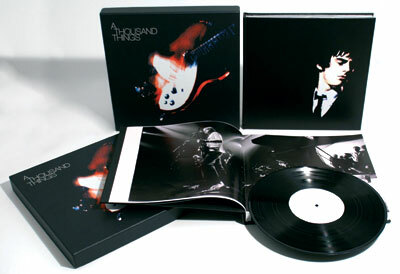 A THOUSAND THINGS is the visual history of one of Britain’s greatest and most-loved songwriters, a landmark tribute to a true British icon, Paul Weller. Written by Paul, A THOUSAND THINGS features rare photos from the Weller family archive, fliers, posters, badges and the work of Paul’s favourite photographers. Many of these images have never been published before. Paul Weller has personally autographed each book and has contributed an exclusive vinyl recording of previously unreleased tracks especially for this boxed set. This limited edition of just 2,000 individually numbered copies worldwide will go on sale in 2008. We want to make sure all those who have registered with us are given the first opportunity to secure a copy. As such, for a limited time only, we are making it available at the special pre-publication price of £225. To take advantage of this offer, reserve your copy now with a deposit of £75. vinyl pressing that has been specially re-mastered and pressed using heavyweight vinyl to audiophile quality. (Shown below is a close-up shot of the Side B master lacquer used in the production of the vinyl). showcasing the quality of songwriting and performance he was to become famous for. This is the original demo that secured The Jam their record deal 30 years ago. Check all this out over at Genesis Publications with all the order details! Previous Entry A Message From Universal Regarding Releases In ’08. Next Entry Paul Weller’s New Album Released In May?